Today’s contractors require products which can outperform long after you have left the job. Simply put, “Done Once Done Right”. Your customers demand the very best from the contractor they hired, which is why most contractors rely on aquaTIGHT®. Laborers and contractors alike appreciate the high performance additive and sealing technology of aquaTIGHT® grout additive. The HydraGuard provides incredible floor seal characteristics, none of which can be evenly matched in this industry. We are proud to offer high tech solutions to the contractors industry. If you are a contractor, then you have come to the right place. We offer the best warranties on the market and, in some cases, will offer transfer-ability for the period ending should the homeowner decide to move on. Learn more below to see what competitive advantage you can earn by using these sealant products. 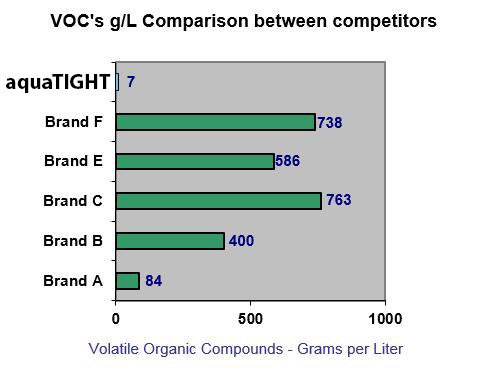 LOWEST VOC on the market for any effective water based products. aquaTIGHT® offers the professional contractor multiple benefits. First, this grout additive leads to the lowest cost per square foot with maximum performance and it outpaces the brands on the market today in terms of sales per square foot. 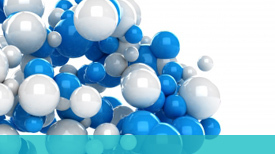 Regulatory hurdles are non-existent with aquaTIGHT® patent technology, “Method to render cementitious surfaces water repellent” We build our products with you in mind, the customers you serve, pets and environmental requirements. All of our water based formulas have been through international scientific, real world and third party testing for safety. We hold NSF International certifications RX-2, R2 and Received Keller and Heckman Safety FDA Approval. 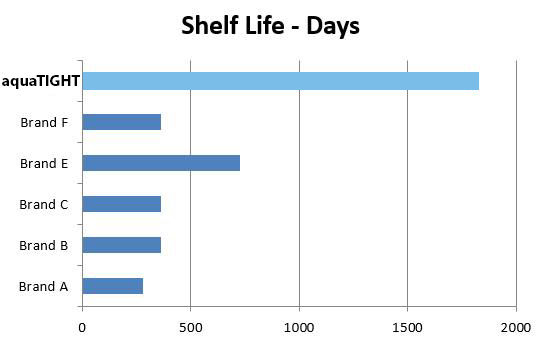 SHELF LIFE of aquaTIGHT® Products are unparalleled. Masterfully engineered, some remark this grout additive is like a fine wine. Let our products sit around a while, and you may continue using till empty. Unlike competitors’ products, which have high solids content that can and will precipitate out over time, aquaTIGHT® is freeze-thaw stable from 0 to 400 degrees Fahrenheit and can be used if thawed. This makes aquaTIGHT® the perfect crack and floor seal choice anywhere in the world, frozen or subtropical. DOT applications, patching, bridge expansion joints, pointing and a host of other applications are examples to mention a few. 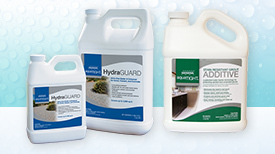 Using HydraGuard as your choice sealer for concrete and other materials is 3X that of any competitor’s product. aquaTIGHT® is All-In All-In-One. The details on how this is done are a trade secret, but we offer to you real science purposely designed to rely on the ingredients in your cement, grout, concrete, natural stones and other precast or cut products. Learn more about how HydraGuard works. A little bit of our HydraGuard formula goes a long way depending on porosity of substrate. Some clients prefer also to dilute if polishing concrete. That’s Right!!! HydraGuard passed a taber test and has shown to grant excellent coverage while surpassing lithium silicate densifier, and HydraGuard densifies as it seals. No other densifier can waterproof and seal while stain protecting at the same time. Flammability used to be an issue with products that worked as well as ours. 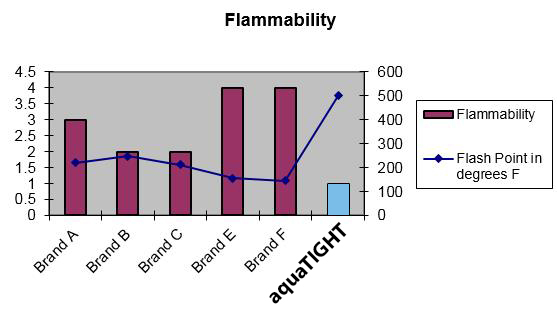 Oil based products or products requiring flammable solvents were what really did the job. Well, times have changed and so have regulations. Creating water based products is no easy task, and they have to perform. I can attest to this having been a 22 year veteran of the commercial and residential remodeling industry. Thanks to a revolutionary scientific method, we’ve created and innovated science, and we can now offer water based products that keep safety in mind and high performance while driving down costs on the projects. This, in turn, generated more profits to your firm or construction company. 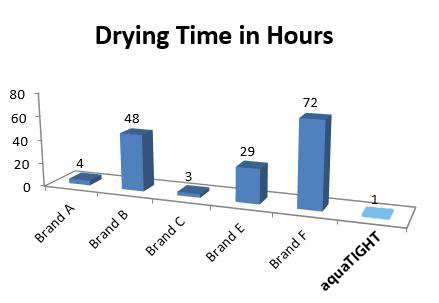 Drying times are not a function of aquaTIGHT® product as the chemistry relies on the substrate it applied too. The magic happens when aquaTIGHT® products comes in contact with the substrates matrixes. 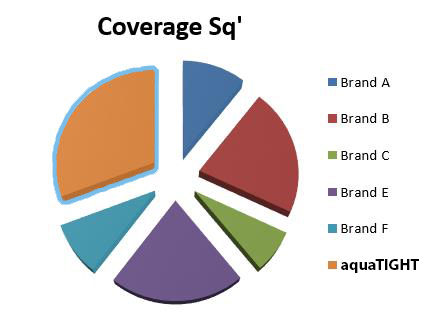 All that are needed to make aquaTIGHT® work is sand, calcium, magnesium, iron oxides, aluminum and any metal type. The good news is these properties already exist in all the products being installed on any construction site all over the world. For that reason, we have less than one hour dry time for HydraGuard and our Additives, which are solely dependent on the concrete, cement, mortars, and/or grouts blended by any manufacturer. Performance can truly be visualized. Based on data analysis and many performance tests on drying, aquaTIGHT® comes with all the benefits needed on most job sites. Our final point and destination: how much is it worth to have the best performing product on the market, deliver enhanced qualities, bundled into a few products that give you peace of mind? A major driver for aquaTIGHT® to exist was innovating, building great performing products by creating them in such a way to be competitive and not engineering them where there wasn’t any cost advantage for the contractor. We knew early on that balance was needed, so we set out to build the best. Performance, grout color, stain protection, guard against efflorescence, easy-to-use, no odor, price point, and a host of other items were looked at intensely. We are confident we have created the best floor seal solution for this industry, and through negotiations with our suppliers, we can truly say no one can beat the cost of our science. We are happy to share and pass that along. 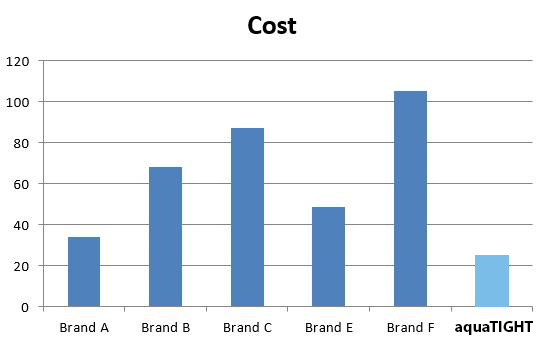 For these reasons and many others, we can also say we are #1 in cost relative to competitor’s products and comparisons to performance offerings.